This just in: Creston Lea makes really cool guitars. OK, so that's not exactly breaking news in Vermont, or anywhere else in the greater guitar-geek world, really. 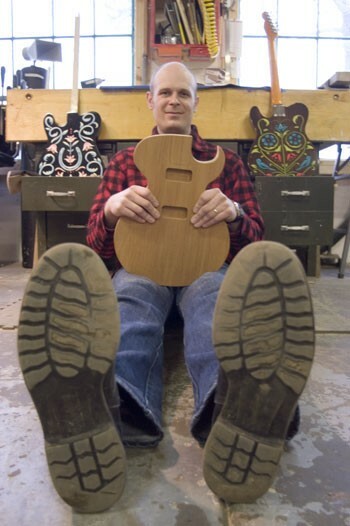 Under the banner of his Burlington-based company, Creston Electric, Lea has been building custom guitars since 2002. And, owing both to his own craftsmanship and the eye-catching, Western-styled artwork by local artist Sarah Ryan that often adorns them, he's developed quite a reputation for high quality and distinctive axes. 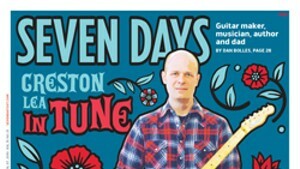 The ringing sound of his Tele-styled guitars is practically the soundtrack to Burlington itself, as several of the area's notable players swear by their Crestons. These include Brett Hughes, Grace Potter & the Nocturnals' Benny Yurco, Anders Parker, Swale's Eric Olsen and Waylon Speed's Kelly Ravin, to name a handful. Lea has quite a few bigger-name acolytes as well, such as Ian MacKaye of Minor Threat and Fugazi, Adam Ant, actress Gaby Hoffman and Son Volt's Jay Farrar. By the way, Son Volt guitarist and Burlington expat Mark Spencer is also known to rock a Creston or six and, according to a new short documentary film, might have been the man who started Lea on his path to becoming a luthier to the stars. That film, Wood & Wire: The Hand-Crafted Guitars of Creston Lea, is a Vermont Community Access Media (VCAM) production helmed by local filmmaker Bill Simmon. The 20-minute doc examines Lea's guitar-building history, his place in the world of custom guitars, his collaboration with Ryan and why, as Lea notes in on his website, the customer is only "sometimes" — read: "almost never" — right. The film features several locally familiar folks who espouse the virtues of Creston guitars, including Olsen, Ravin, James Kochalka, freelance journalist Matt Bushlow — who profiled Lea for Fretboard Journal — and Spencer. The film also includes another BTV expat making (sound) waves in the boutique electronic instruments world: Tim Marcus (ex-Concentric), founder of the San Francisco-based amp company Milkman Sound. VCAM will launch Wood & Wire online on Monday, December 1. The flick will also be featured on the Fretboard Journal website. In the meantime, check out the film's trailer below. Wood & Wire trailer from VCAM Vermont on Vimeo.